You probably know that we love our commenters—we want to make babies with them. The front is great, but the back is ! @#$% hilarious. 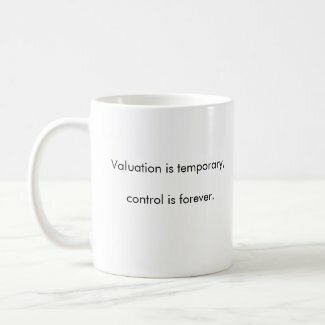 So far my startup has been self funded, but now I’m tempted to take some VC, just so I’ll have some keen insights that will get me a shot at getting this mug! I too am new to this strange world…confusing terms, inflated egos, dream crushers (and stealers) at every turn. Tread cautiously neophyte, the words of the VC can be intoxicating. 1.Enough of the billion dollar market opportunities for the industry you are in. Please. If I hear another fellow entrepreneur say that his market opportunity is $10,000,000,000 and he is going to have 2% market share in year two I am going to puke. No you aren’t, and well all know that. 2.Don’t fall into the “What is your valuation?” trap when a VC asks. You probably don’t know or will overstate it AND THEN HAVE TO JUSTIFY IT (and you will look silly). Just tell them how much money you are looking for to pursue your idea the right way. You can get into the specifics of valuation when you have a term sheet. 3.Know your audience…I just listened to a kid present his idea on alternative energy. It was probably a good idea, but I don’t want to know about the DNA sequence for algae. He was thirty minutes into his presentation when I learned that algae could be used as a replacement for diesel fuel. By then I had a headache and wanted to go home. It is amazing how motivating a coffee mug can be.